The foundress of the Apostles of the Sacred Heart of Jesus was totally enamored of Christ as her mystical Spouse to whose Sacred Heart she consecrated her entire being and life, so rent by suffering and even persecutions. Over the course of many years as a seminarian and priest, I have been blessed to attend beatifications of women who have made a singular impact on the life of the Church. For example, I recall that as a “new man” (first-year student) at the “NAC” (North American College), I was privileged to attend the beatification of Josephine Bakhita. Later, as a young priest, on the occasion of the twenty-fifth anniversary of Pope John Paul II’s election in 2003, I received the grace to concelebrate the beatification of Mother Teresa of Calcutta, whom I had met when she visited the North American College back in the early 1990s. However, on Saturday, November 3, in the Pope’s magnificent Cathedral Church, the Basilica of Saint John Lateran which, as its imposing façade reminds us, is “the mother and head of all the churches of the City [of Rome] and the world,” I experienced an even greater joy because I was blessed to concelebrate the beatification of the foundress of the Apostles of the Sacred Heart of Jesus, Mother Clelia Merloni, whose congregation of Sisters taught me in elementary school. It was truly a magnificent and unforgettable event. The sight alone of 300 Apostles from all over the world in their beautiful black habits (truly a vision of the “feminine face of the Church”) made me nostalgic for the good old days when the Sisters taught me to be a gentleman, a scholar, and a future priest. I was not the best of students in grammar school, but as I progressed in my studies from high school to university, from seminary to graduate school, I became more and more adept at putting to good use the basic skills the good Sisters taught me when I was still an undisciplined, shy, and awkward young man. I will be forever grateful to Sister Cora to whom I first revealed my desire to become a priest. She later gave me a poem she wrote on the priest as the architect or archeologist of God. Sorry, Sister, I can’t recall the precise title after all these years. But report cards are over, so I guess I get a pass! I hope that by the grace of God in some small way I have contributed, spiritual speaking, to the excavating and rebuilding of Christendom through the exercise of my priestly ministry these past 21 years. I am also grateful to Sister Cora for another reason. When I told her I wanted to become a priest, and that I enjoyed practicing (“saying”) Mass at home – I had learned pretty well watching the good example of the Scalabrinian Fathers from Northern Italy in my home parish for whom I served daily Mass – she gave me a Roman Missal, which I still keep in my father’s Manhattan apartment where I grew-up. Many other Sisters taught me over the years between Our Lady of Pompeii in New York City’s Greenwich Village and Saint Joseph near Knickerbocker Village (too many to name here). Some Sisters have gone to their eternal reward; some, unfortunately, left religious life; others stayed the course, for which I am most grateful. Those were historic, colorful but tough neighborhoods. Greenwich Village is a Bohemian paradise, while Knickerbocker Village in Lower Manhattan’s “Fourth Ward,” was made famous by the likes of Jimmy Durante and the infamous Rosenberg spies, who were executed by the U.S. government for espionage. In Greenwich Village, “Vinny the Chin” Gigante roamed around muttering in his bathrobe and Benjamin “Lefty Guns” Ruggiero (made famous by Al Pacino in the film “Donnie Brasco)” was a neighborhood regular. Years later, when I was a parish priest at the Church of Saint Andrew in Lower Manhattan, I took a walk in the nearby neighborhood of Tribeca, full of trendy restaurants and famous residents including actors Robert De Niro and Leonardo Dicaprio. As I strolled leisurely along Greenwich Street, I bumped into James Gandolfini (RIP), more popularly known as “Tony Soprano” of the HBO award winning series, “The Sopranos.” He was a real gentleman and full of humanity, not a snobby, stuck-up “divo.” We spoke for awhile about some of our favorite topics: The New York Jets, Tribeca, Film and Italy. Gandolfini later died prematurely in Rome of a heart attack after a meal at Trastevere’s popular seafood restaurant “Sabatini” that overlooks the ancient Basilica of Santa Maria in Trastevere. In the course of our conversation outside his Tribeca home, Gandolfini told me that he was so proud that his daughter was, at that time, a student at Our Lady of Pompeii School. What a small world! Those years at Our Lady of Pompeii and Saint Joseph were the most formative years of my life, and the Sisters were instrumental in generously assisting my family financially so that my sister and I could attend their excellent schools, especially since my father and mother had separated when I was only seven years old and my sister five, leaving my Dad (himself an orphan) to raise us both on his own. When I arrived at the Lateran, on the side where Rome’s tallest obelisk is (the side nearest to the ancient baptistery – which is the prototype of all baptisteries in the West), the first person I greeted was the Bishop of Terni, known for one of Italy’s most important mountain resort towns, Terminillo. I chatted with the Bishop for awhile before heading into the Basilica to vest with my brother-priests in the spectacular “chiostro,” one of the most beautiful cloisters in Rome, along with that of Saint Paul Outside the Walls and the Chiostro of Bramante near Piazza Navona. There were over a hundred priests from all over the world vesting. I recognized an American priest who works in the Secretariat of State and whose cousin is an Apostle (in fact, the former Mother General). We exchanged pleasantries, reminisced about the good old days in Rome thirty years ago, and then filed out in procession to the altar, taking our places behind the gorgeous baldacchino, over which are conserved reliquaries containing the head of Saint Peter (crucified upside down in the Circus of Nero inside the Vatican) and the head of Saint Paul (as a Roman citizen, he was given the “privilege” of being beheaded on the Via Ostiense, rather than being crucified). Legend has it that Saint Paul’s head bounded three times, causing three fountains to form. Hence, Rome’s Abbey of the “Three Fountains” (“Tre Fontane“). O my God, I adore you, I love you with all my heart, with all my soul. My God, I bless you for all that you do and that you want to be done. My God, I give my heart to you, my life, my future, my entire self […], and forever. My God, I hope in you, in your pardon, in Heaven. My God, I will do everything for you today, this month, this year, forever, until my last breath […] nothing, nothing for my satisfaction. My God, I will observe your commandments, your counsels, your aspirations. My God, I praise you, I want to praise you with my lips, with my actions, with my sufferings. My God, communicating with you in your presence, I do not want to forget for a single instant your presence. My God, I will pray […] much […] I feel that I must pray […] give me the love of prayer! My God, I will be silent in moments of inquietude, when I am in a bad mood and when I am impatient. My God, I unite myself to your angels, to your saints, to my daughters who love you and with them I too want to love you! My God, I will visit you in your Temple, I will come to see you in your holy tabernacle, and I will assure you of my fidelity, but you, help me, with your holy grace. Amen. Mother Clelia was totally enamored of Christ as her mystical Spouse to whose Sacred Heart she consecrated her entire being and life, so rent by suffering and even persecutions. Her personal motto was “Solo Dio!,” (“God alone!”), and the Pauline motto of the Congregation, “Caritas Christi Urget Nos” (“The Charity of Christ Compels us”). I had no idea that Mother Clelia had suffered so much and for so long. For a period of twelve years, she was an outcast from the Congregation she herself had founded at Viareggio, making good use of the money she inherited from her father and receiving support from Blessed John Baptist Scalabrini, the Founder of the Missionaries of Saint Charles Borromeo. Charles Borromeo was the brilliant and fervent Archbishop of Milan, one of a minority of bishops who seriously sought to implement the decrees of the Council of Trent in the sixteenth century during the Catholic Counter-Reformation. After the Cardinal Prefect of the Congregation of the Causes of Saints, Cardinal Angelo Becciu, began the Mass with the Introductory Rite and Penitential Act, a brief biography of Mother Clelia was read by the Postulator of the Cause, Andrea Ambrosi, Esq. After which, the Apostolic Letter of Pope Francis was read by Cardinal Becciu, thus officially declaring her blessed. Then, in dramatic fashion, a large image of Mother Clelia was unveiled as two very happy Apostles rang bells which hung to the right and left of the impressive image. On the big screens, near the sanctuary, I could see some of the Sisters weeping tears of joy and I caught a glimpse of the incorrupt body of Mother Clelia, who is buried at the Apostles Generalate, not from the Lateran Basilica. Mother Clelia, who was born in Forlì on March 10, 1861 and died in Rome.on November 21, 1930 was initially buried in Rome’s “Campo del Verano” cemetery; in 1945, her body was transferred to the Chapel of the Motherhouse. 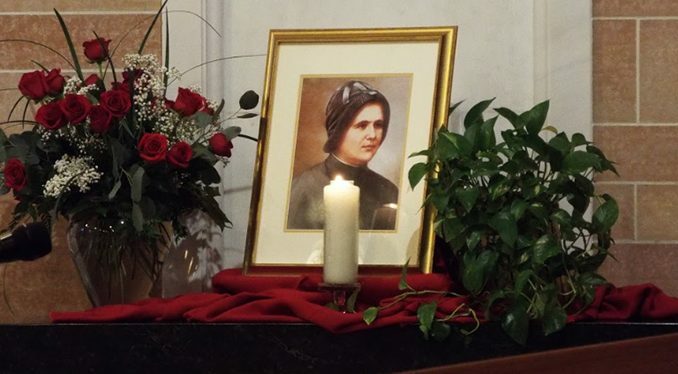 After the unveiling of the image of Mother Clelia, select Sisters brought up in procession some of their Foundress’ relics which they placed near the altar, along with candles and flowers. You are the Sanctuary of grace, You the refuge of peace. Where the soul sings and the heart reposes. 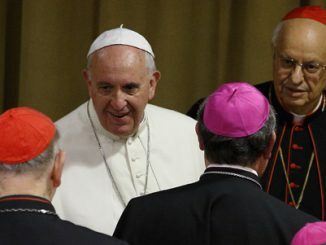 After the hymn, Cardinal Angelo De Donatis (Vicar of Rome) thanked the Holy Father for the proclamation of the new Blessed and then embraced Cardinal Becciu who, in turn, gave to him, the Postulator of the Cause and the Mother General of the Apostles copies of the Apostolic Letter. The First Reading was taken from the Book of Leviticus 19:1-2, 17-18 in which the Lord challenges the Israelites through Moses, “Be holy, for I, the Lord, your God, am holy”; Responsorial Psalm came from Psalm 14 (15) with the response, “The just one, O Lord, will dwell on your mountain”; the Second Reading was taken from 1 Corinthians 12:31-13:13 (Saint Paul’s Hymn to Love); the Gospel verse was based on John 13:34 (“I give you a new commandment, says the Lord: as I have loved you, thus you also love one another”); the Gospel was from Luke 6:27-38, in which we are exhorted to be merciful as Our heavenly Father is merciful. The homily of Cardinal Becciu was insightful and likewise the Post-Communion remarks of Cardinal De Donatis who emphasized Blessed Clelia’s espousal relationship to Christ, her magnanimous long-suffering (the Cardinal became emotional at this point), and her special love for priests especially those who experienced crises. That last element of her spirituality impressed me in a particular way and gave me comfort because I have had my share of crises over the years. Now I have an extra heavenly patroness to whom I can turn in my time of need. Of every virtue you are the abyss. The rest of the Mass proceeded as usual. I was impressed that the Apostles chose to have the Roman Canon (albeit in Italian, not Latin) as the Eucharistic Prayer. I was disappointed that Cardinal Becciu did not chant the orations and Preface of the Mass because, when he finally intoned the Solemn Pontifical Blessing to conclude the Mass, he revealed that he had a pleasant singing voice. At Communion, Monsignor Frisina led the choir in singing a well-known hymn he composed entitled “Chi ci separerà” (“Who will separate us”), and it continues “from His love? Tribulation, perhaps the sword? Neither death nor life will separate Us from the love in Christ the Lord.” This hymn is based on a passage from Saint Paul’s Epistle to the Romans (8:35). Moreover, as a Post-Communion meditation we sang Monsignor Frisina’s beautiful rendition of the “Anima Christi” in Latin (which was also sung at my First Mass). Present at the Mass were a few other Cardinals including His Eminence, Peter Turkson, a gathering of bishops, and a few canons of the Basilica in their magenta robes. At the conclusion of Mass, we turned to face a statue of the Madonna and chanted the “Salve Regina” in Latin. After which, we processed out and returned to the cloister to unvest. Before returning to the Basilica, I had a nice conversation with a middle-aged pastor from Naples, who told me that he was likewise taught by the Apostles as a young boy and now had the joy of working with them in his parish. He was very proud of this and of the fact that many of his countrymen were immigrants to the United States who had benefitted from Mother Clelia’s charitable work on behalf of the poor and marginalized. Amidst the throngs of the faithful and the hundreds of Sisters still lingering about the Basilica, the Holy Spirit led me to find the only Sister who I knew for sure would be there, but whom I did not have a clue how to find; I literally bumped into Sister Deborah among the hundreds of nuns! We had a lovely conversation and, among other things, she told me that her Congregation is learning more and more about their Foundress on a regular basis due to the discovery of previously unknown documents (which explains why I learned so much about Mother Clelia just from the beatification ceremony). Sister Deborah, who now works in Pennsylvania with disabled children, was the last principal of Saint Joseph’s Elementary School before it unfortunately closed around five years ago (a long and bitter saga beyond the scope of the present article). Sister Deborah grew up in the Alfred E. Smith housing development (New Yorkers call them “projects”) right across the street from Saint Joseph, which she herself attended and where she discovered her vocation to be an Apostle. In Sister Deborah’s time, the neighborhood was inhabited by Hispanics, mainly Puerto Ricans. It is where I first learned to pick-up “Spanglish” before I subsequently studied proper Spanish in high school and became fluent after spending the Summer of 1993 in Spain working in a parish as a 21-year-old seminarian. I returned to Santa Maria in Campitelli amidst gentle rain (the day began sunny and bright!) and retired to my room overlooking the Jewish Synagogue where I prayed Vespers in Italian, “tanto per cambiare,” (“just for the sake of change”) as the Italian say, because I normally pray it in Latin. Foremost in my mind and heart was a fervent prayer of thanksgiving for the gift of Blessed Clelia Merloni, who gave the Church the gift of the Apostles of the Sacred Heart, who gave me the gift of a lively faith and fostered my priestly vocation.